Functional Medicine views the body’s signs and symptoms as the leaves of a tree that is rooted in the habits of a lifetime: nutrition, sleep and relaxation, exercise and movement, stress, and relationships. In doing so, it looks at the root cause of disease. Nutrition and lifestyle changes shift the body towards a path leading to health and vitality. Despite Edison uttering these words more than 100 years ago, medicine in the last century saw a complete departure from this approach. It isn’t limited to only treating symptoms in a short 15 minute GP consultation. This system is failing many with chronic disease. Instead, a 60 or 90 minute consultation allows the practitioner to obtain a more detailed understanding of the development of your health concerns. This allows them to understand the root cause of your condition, and allows for a therapeutic relationship between the practitioner and patient. 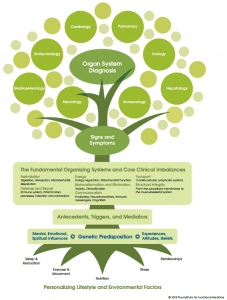 Functional medicine asks why a condition has developed in the first place. For instance an auto-immune disease may be linked to problems in the gut, toxins from food or the environment, genetics, infections, and stress. By identifying and addressing your particular cause, the body can be given the best chance to return to health the best it can. Functional Medicine practitioners often recommend cutting edge laboratory testing. These tests go beyond the labels of disease and look at the full scope of the patient’s physiology. Your doctor may typically run lab tests that match results to a pharmaceutical drug. As a Functional Medicine practitioner often recommends personalised nutrition and lifestyle (sleep, rest, movement) changes, they requires more complete tests that look at the underlying physiology. These tests allow a much clearer picture of how any why your body is not functioning as well as it could. Functional Medicine may address identified imbalances in the body through nutrition, supplements where appropriate, aswell as sleep, rest, movement, and stress reduction. The body requires all of these areas to be addressed in order for the to regain it’s health and vitality. Lifestyle interventions also disturb the body far less than pharmaceuticals or surgery. Functional Medicine originates from the work of pioneers such as Dr Mark Hyman, Dr Jeffrey Bland, and practiced by Chris Kresser. Visit our Consultations page for more information on how Fairfield Nutrition works with Functional Medicine or join the Facebook Functional Medicine Australia group. Also, read this blog post on what is Functional Medicine and how it can make diseases disappear. Other conditions caused by living in the modern world..
We are now offering a free one-on-one phone conversation to explain how we can help you and how we work.